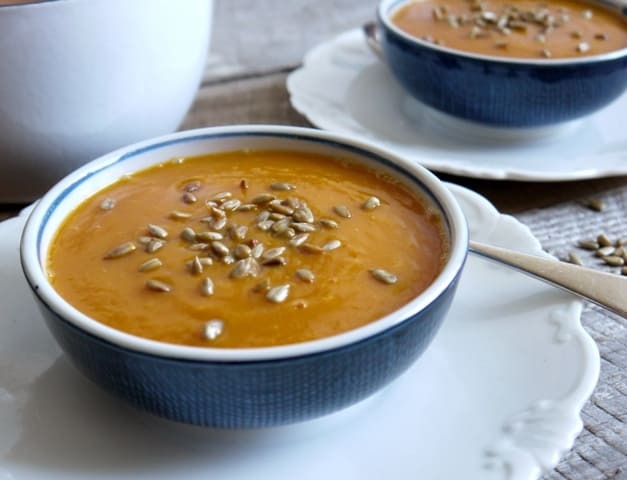 Sweet, earthy, butternut squash roasted with a vibrant mix of spices until the edges begin to darken and caramelise thereby bringing in another layer of flavour. Crazy, crazy good. Harissa has become such a staple in our kitchen. I’ve tried this gorgeous blend of peppers, chilli’s and other herbs & spices (including, strangely, rose petals) with everything from mackerel to jacket potatoes and I love it. For those that haven’t tried it before it goes way beyond bringing heat to a dish, the balance of spices and flavours are divine and incredibly moreish. After whizzing the soup in the blender (it’s the Optimun 9400 all the way in our house) steal a taste and make sure you’re happy with the flavours. If not, add a little more harissa and whizz, taste, repeat until your tastebuds are in heaven. I hope you get a chance to give this recipe a whirl, and if you have a penchant for deep, flavourful spice, I promise you’ll love it. Peel and chop the squash into chunks. Pop in a baking tray and dollop with the harissa paste. Mix around until each chunk is coated. Drizzle with oil and mix again to ensure the oil is evenly spread around. Roast the squash for 20-30 minutes or until it has softened and started to caramelise around the edges. Blend with the boiling water for 30-60 seconds until it is smooth. Use a little less water if you prefer a thicker soup, or a little more if you like it thinner. Toast the sunflower seeds in a hot, dry frying pan until lightly browned and scatter over each bowl of soup for a little bit of tasty texture. How about a footnote recipe for the Harissa Paste? This soup looks and sounds amazingly tasty and delicious. Hi Janie! It has been too long since I stopped by so wanted to say hello. Hope things have been well with you! This soup looks really yummy and perfect for those in my neck of the woods as it has turned off cold the past couple days! I love butternut squash anything, Delicious and I adore that velvety texture. 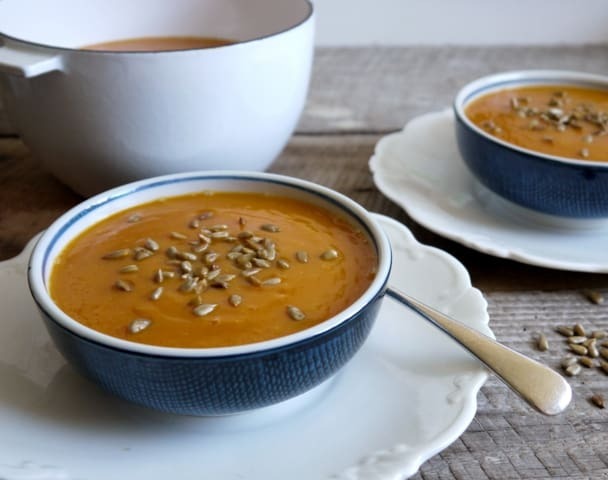 Oh yes, can guarantee I’ll love that soup Janie – pumpkin soup is my favourite and it works so well with spices. I made my own harissa paste once many years ago and am now wondering why I haven’t made it again. Yum! I still haven’t tried harissa, I need to give it a go! I’ve never actually tried harissa paste, but it sounds so good in this soup that I’ll have to get some. I can’t wait to read about your adventures making it yourself! 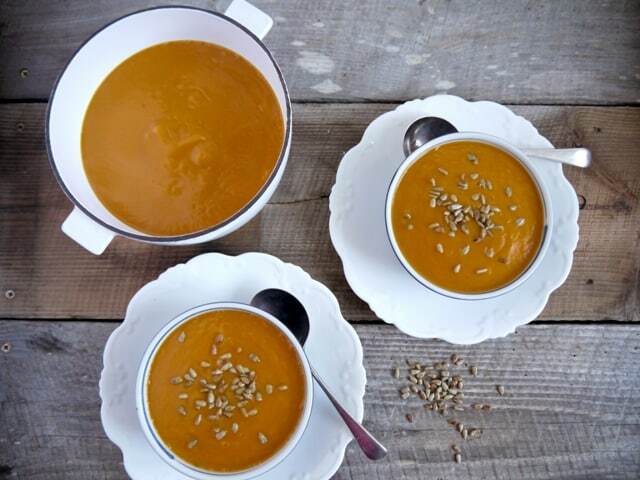 Nice soup and great idea to add harissa. I love this time of year food wise. You just cab’t beat butternut squash. I know, and boy have I missed soups! I love how you have used paste in this soup. I bought back a load of spices from Morocco and tried a courgette soup inspired by Sabrina’s book Persiana last weekend. Would never have thought of using the paste. Silly me. Such a simple idea – especially as I have tonnes of it! I guess you’d get the same outcome from using the dried spices though? I must admit I only buy the paste as it is SO versatile and can be added to most things! Love this, Jamie! 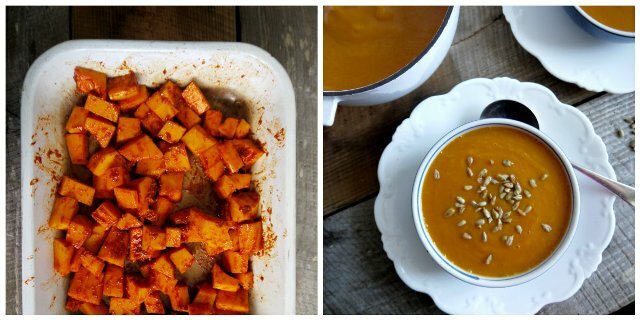 I adore roasted squashes and harissa together but not done them together in a soup. And so easy in a Froothie. Fabulously easy and flavoursome. Yum! Absolutely! They go together soooo well! This looks fantastic, I have had harrissa lurking in the fridge and kept forgetting to use it, this would be wonderful way to use it. I have only been able to find Harissa powder, not paste so I used a little extra olive oil & coated the cubed squash with the oil first. Also, I served it just baked (not made into the soup) as a side dish to venison chops. Very yummy! Plan to make the left overs into soup. Oh, clever you Lisa! Isn’t it a quick, but impressive dish?